Promoting your products on Twitter from an iPhone is something all companies are doing, and it’s not a big deal unless your name is Samsung. It turns out that Samsung is just as oblivious as all the rest when it comes to Twitter and its rules. It’s a well-known fact that Twitter embeds the name of the platform you’re using when you’re sending a tweet. But this well-known fact eludes even telecommunication companies. You can argue that it’s a mistake and people should not make a deal out of it, but the truth is that it’s actually a matter of perception. And Samsung sending messages from an iPhone doesn’t look good, by any stretch of the imagination. Samsung has a lot of verified Twitter accounts, all over the world, and the one that caused the blunder is actually from Nigeria. 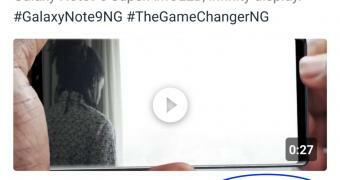 Some “poor” guy posted an ad that was celebrating the AMOLED display on the Galaxy Note 9, and he did it from an iPhone.